Yes, Finally the Villan arises for the Paid Realtime feed softwares. May be it would be a super hero among common people. 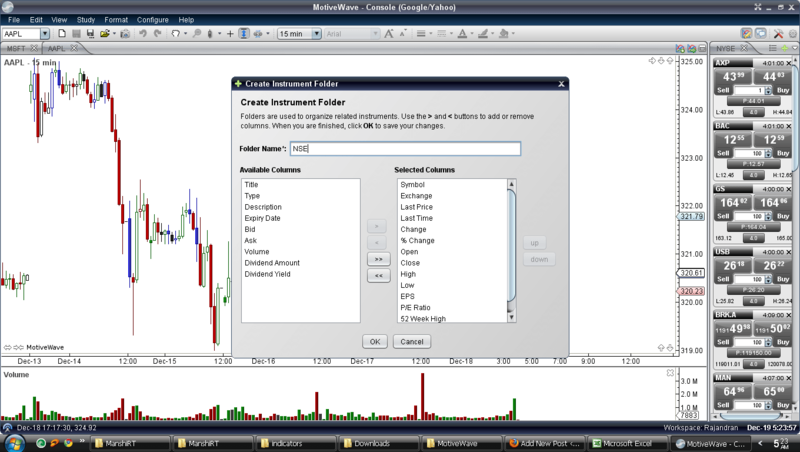 Motive wave is currently a free trading/Charting software just like Ninja Trader and it is free till its Pre-Launch initiative. 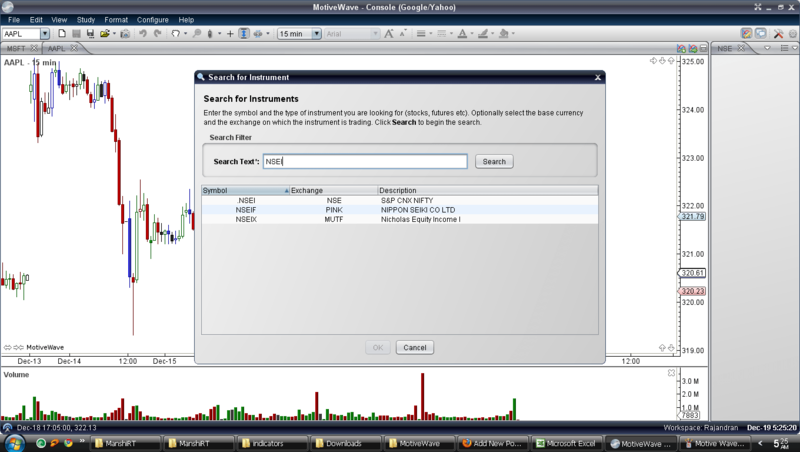 MotiveWave is similar to just like any charting packages like Amibroker, MetaStock..etc. with all the basic and some advance indicators like Gartley, Elliot Wave, Kaufman Adaptive moving average and many more advance indicators. But it slightly differs from other charting package as its supports realtime intraday charting with free backfill from google/yahoo and it contains more than 3months of intraday Historical 5min/15 min data available a year of historical intraday hourly data is available. MindBlowing isn’t it? Moreover free datafeeds are available for the world stocks, indices and even forex too. What else you need at free of cost? Step 2: One you got registered you will recieve a license file(mwave_license.txt) via mail. Save the attached file (mwave_license.txt) to your computer desktop. Step 3: Run the setup program (mwave_setup.exe) that you downloaded in Step 1. Complete all steps in this installation wizard. Step 4: Run the MotiveWave application by clicking on the desktop icon or from the Start Menu. On page 2 of the initialization wizard you will be asked for the license file you downloaded in Step 2. Step 5: Pages 3 and 4 of the initialization wizard will allow you to create a workspace. While creating work space select the connection information Service as Google/Yahoo as shown below. On completion MotiveWave will start. Now enter the google finance symbol or the stock name to search from its database. For Nifty the google symbol is .NSEI .by entering the same on it the software retrives the symbol from the database. Now press ok so that the symbol adds to the NSE folders list. Now right click on the .NSEI quote bar and select Open chart Tab. One you select then the next instant the Nifty intraday chart arises along with auto backfilled data.Cool Isn’t it? My Experience with this software is really awesome and user friendly with less jargons . Iam also to configure my Ichimoku trading system even 5-13 EMA channel trading system and also still need to explore a lot in this software package. Definitely worth a try at free of cost. Custom Motive Wave Settings for Channel Offset Trading System Check out the custom motive wave settings for Channel Offset Trading system.Hope this would give you a better vision on markets while trading. Atleast to know which side to trade most of the time. Thank you for the free bees. Wether can it be used for Indian Commodities also? Please reply. 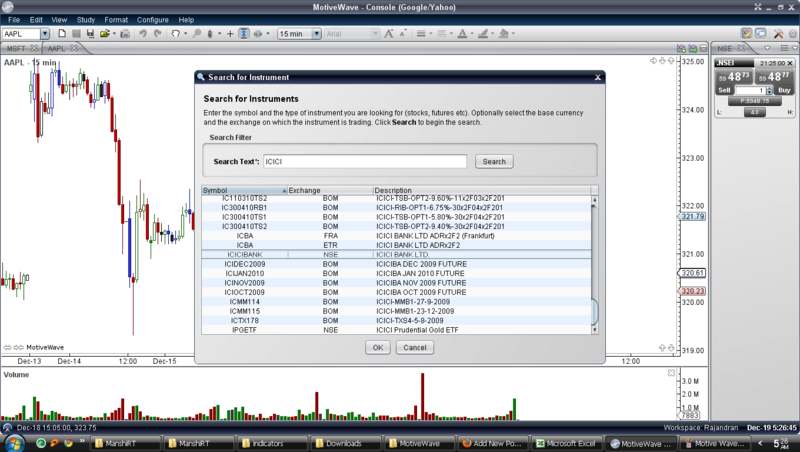 Although MotiveWave is a charting software for beginners, it is NO WAY compared with advanced and proffessional charting softwares like AmiBroker or MetaTrader. 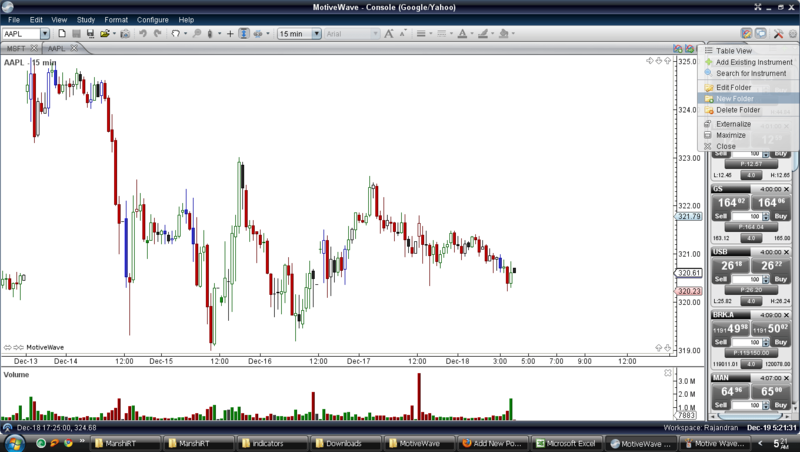 No charting software can beat either AmiBroker or MetaTrader due to their powerfull capabilities!!. If someone can write software which could be superior to AmiBroker/Metatrader then all proffessional traders in the world can switch to that one, I dont think that will happen in the near future!!. I wonder the chart is real time? If it so, then would be of great help to all. thanks. Yes you are right. May be this charting software wont be superior to Amibroker/Metatrader. But definitely fulfill the basic need of indian investors as they earlier need to pay for Realtime data. But now they no need to do that. Also its fulfills the basic and necessary qualification of a Charting software package. 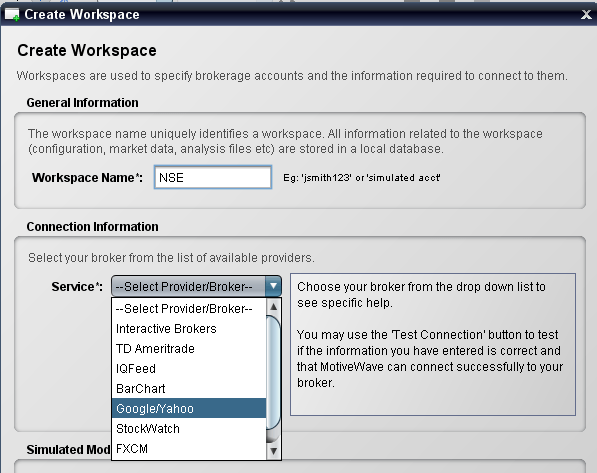 From a charting perspective, MotiveWave is actually much more advanced than AmiBroker and MetaTrader. It fully supports many advanced trading strategies, including Elliott Wave (full support of all degrees), Gann, Gartley, and Fibonacci. However, if you’re looking to do automated trading or write your own studies, at this point, AmiBroker or MetaTrader may be a better option for you. Can we add indicators for eg. harmonic patterns on mt4 software ?tx. thats y i always visit ur site. for new stuff. i tried this one, it works well, but will take some time to use to. but i wanna know that how long they will keep this free and what will the charges they will ask? when they go paid. 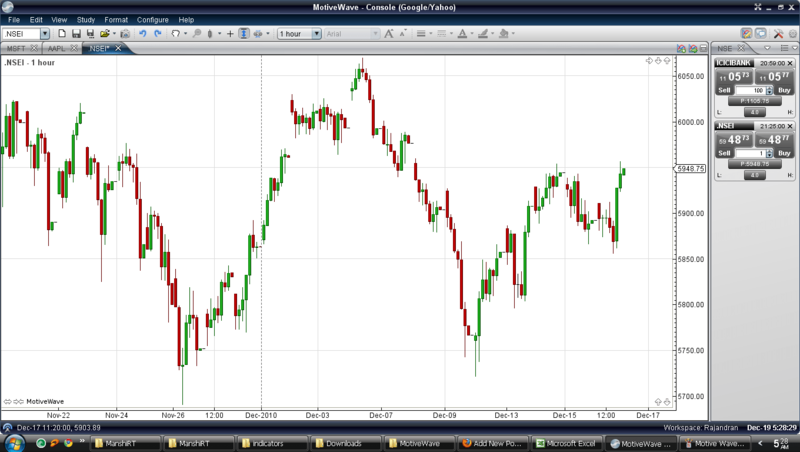 Hope you know the capabilities of the AmiBroker charting software. If not visit http://www.amibroker.com. 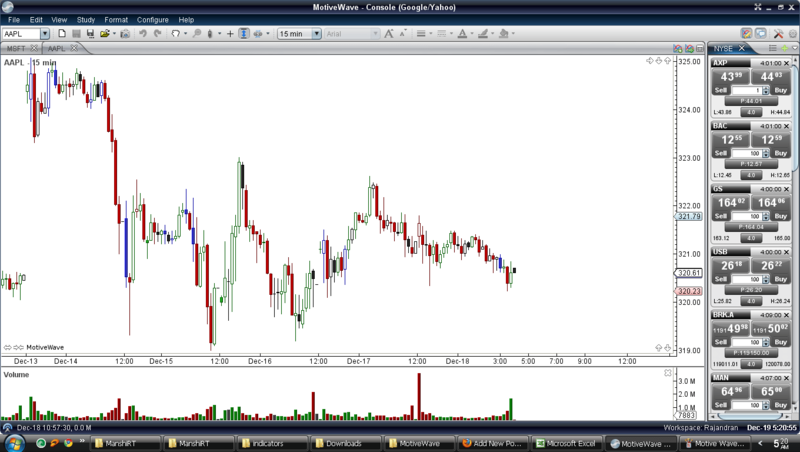 I agree that MotiveWave is for beginners and for indian investors who are not a proffessional traders. If you wanted to compete with other charting softwares like AmiBroker/MetaTrader, you have to support all the powerfull features present in AmiBroker and Metatrader including the performance that could be equal to OR greater than those. One question though in candlestick chart it’s showing 4 different colour, White (for upside) black (red for downside) but besides that sometimes in one or two candles its also showing black and purple candle. Any ideas of what it means. Thanks for introducing a good trading software. configured Ichimoku trading system and 5-13 EMA channel trading system. working fine. so it backfill data and show RT data via using google or yahoo? Thank you for introducing an excellent software where data feed is inbuilt and comes free presently. I tried it on 23rd and 24th Dec’10. It worked very well on 23rd but didn’t on 24th. The data was either absent or delayed. Moreover the data is of today(24th) but the time is of yesterday. Hours and minutes also did not match. Any User’s guide is available? Thank you very much sir for share this software, it’s really a gift. easy to download and install takes just 5 min. it’s obsultely realtime with google. last time i tried ninja and downloaded takes long time to instal. after that i check with trading hours it’s time delay of 15min. so i uninstall, but motivewave is 0 sec delay. thank you for service. Sivakumar… as of now custom indicators are not possible in motive wave. Any how the software rocks! MotiveWave is working excellently. Thanks for introducing this charting software. The problem of time not showing IST but something else for previous day is still present.Could you please advise how to get NIFTY FUTURE and BANK NIFTY FUTURE.I am getting NIFTY and BANK NIFTY but not the futures for the same. Are there symbols for the future scrips of the indices? Thanks. thanks for the software buddy, IN Add study i only get 2 options overlays and indicators, whereas my friend get recent, overlays, general, volume based, welles wilder and much more, why is that so, is there something i have to change, pls do let me know, thanks in advance. One again iam thanking mr.rajandran to share these software.my trading system changed by motive wave. thank lots motivewave and rajandaran sir. Thanks for introducing this wonderful software. motive wave did not update several scrips today including NSEI. Take care when trading with the help of this chart. Its working. Try refreshing the charts. The google/yahoo data is still free even after you purchase motivewave. Your Software Rocks. My question is in paid version is it possible to tweak RSI Indicator so that it can show two lines (two different periods, say for example usual 14 period with 3 period line) in a single indicator window . In MT4 one can do that. @ Rajenran @ Leigh thanks for this wonderful software . a million thanks for your great help. u r too much dear!! u and ur blog has been a great boon for me. i am not quite clear why to change the original setting of ichimoku(9,26,52) to 3,12,18.
i have solved the problem after a lot of effort. i want set the indicator once and keep using it for all scripts as we saved as templates. how to set in this motivewave software sir? Today it seems motivewave is not working, its not updating the nifty automatically, any issues or have they stopped providing the feed. Do we need to have subscription for it. hi dimak, in motivewave Intraday stochasticindicator is not working how to resolve these problem pls guide. thanks Dimak for your timely information regarding nifty and bank nifty indices. Trade Edition Lifetime License, Analyst Edition Lifetime License. 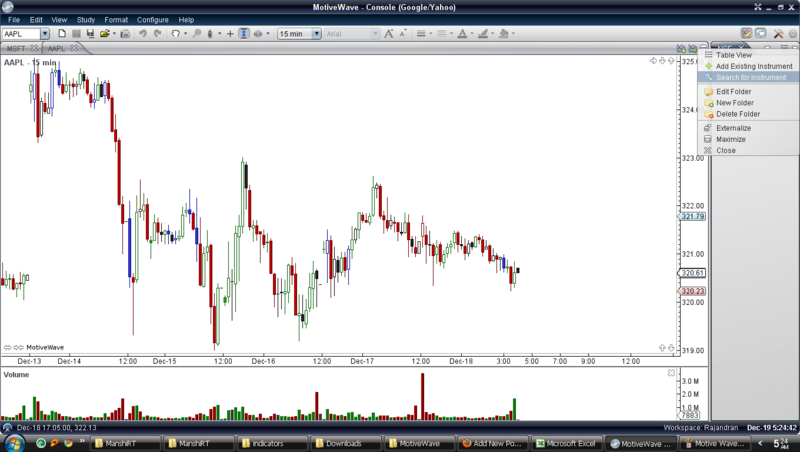 Could you plz let me know whether motivewave supports nifty futures, as am unable to find the symbol to add the same. Also, does DATAFEED supports nifty futures also for amibroker ? Good Morning. How are you? Little help required. Last week, I read information about MotiveWave software on your website. I downloaded the free trial version of 14days. The software is extremely good. The software is fulfilling all my requirements. Many thanks to you. Now I want to purchase Basic Analyst version of MotiveWave software. I stay in Mumbai, Bhandup. Can you please tell me how can I get the software license in India? I usually avoid paying on net. Yes it supports realtime data from google and yahoo. Is it possible to get data feed using odin or sharekhan’s trade tiger for motive wave??? if yes please do help me out, it will be a big help to me..
No you cant use data from your trading terminal to feed motive wave software. Is this software still FREE? Checked link “Download MotiveWave” and lead to 14 day trial. Is there FREE Real Time quote for MotiveWave? Just read Odin Feeder works with Ninja Trader. Does QuoteTracker work with Ninja Trader? i wanted to subscribe for motive wave ultimate edition. i am not able to decide at what Forex rates we are charged if we buy through NETBANKING or CREDIT CARD. can you please guide me sir. Roughly around Rs62-63 per USD. Nope currently only Esignal supports for MCX feeds to Motivewave. Download the software demo from motive wave website. Any possibility of getting MCX counters in MotiveWave? If not, US commodities ? You need to get Data Access from Esignal (Subscription based) in that case it is possible.